This treat couldn't be any easier. 1.Melt your Quest bar in the microwave for 10-15 seconds or until soft. With a spoon, section into 5 or 6 pieces and shape into small balls. 2. Melt 2 squares (adjust amount as desired) of Lindt extra dark chocolate in the microwave. 3. 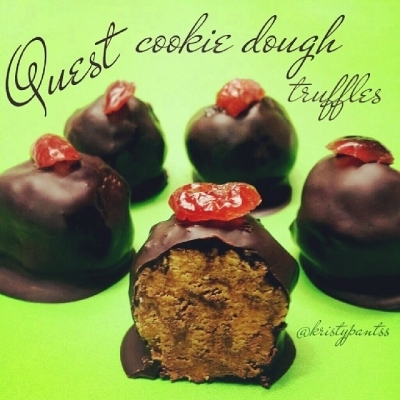 Roll each Quest ball into the chocolate and refrigerate on parchment to set. 4. Top with optional toppings such as dried fruit or nuts if desired.